An engrossing sticker book packed with over 170 stickers to get soldiers, sailors and pilots ready for action as they brave danger on land, at sea and in the air. Features historically accurate uniforms and costumes, from U-boat commanders, snipers and paratroopers to resistance fighters and air raid wardens. The simple text contains fascinating facts about fighting and life during the Second World War, written in consultation with a historian. 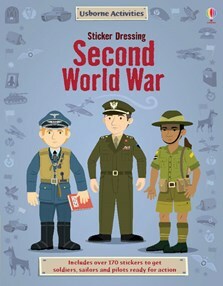 Sticker Dressing Second World War [is] another excellent addition to the "Sticker Dressing" series from Usborne, with over 170 stickers covering the uniforms and personnel of the war.